Visiofocus® er hitamælir sem þarf ekki snertingu til að mæla nákvæman hita. 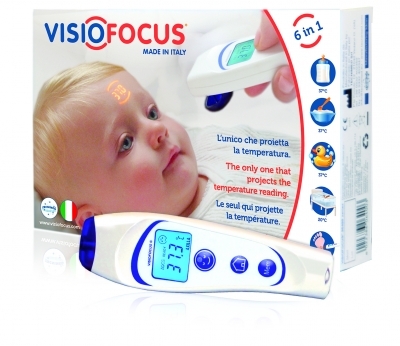 Measure your baby's temperature at first sight, with VisioFocus®. Visiofocus® takes your baby’s body temperature without contact and projects the temperature reading on his forehead: it simply reveals the body temperature, without ever coming in contact with the skin. Just bring the thermometer close to the forehead, at the distance that the thermometer itself will tell you, so that the reading temperature will appear on the forehead. The projection system indicates the correct reading distance, that is essential to obtain accurate measurements. Visiofocus® is an astonishing thermometer meant to allow moms and dads to take the temperature of their baby with comfort, safety, hygiene, but also rapidity and precision, without waking him up when he is sleeping. 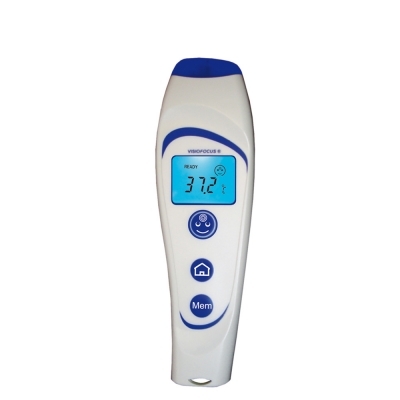 Visiofocus® – the Thermofocus® evolution, the world’s first non-contact thermometerprotected by several international patents - is the only thermometer in the world that projects the temperature reading on the forehead or on the objects’ surface. Press and hold down the “FACE” button to turn on the lights. Hold the thermometer perpendicularly, close to the center of the subject’s forehead, until you can read the temperature completely between the two arches. Release the “FACE” button and hold the thermometer in position until the lights start flashing. You can also read the temperature on the display. The thermometer goes onto standby after 20 seconds and displays the ambient temperature for 4 hours before turning off. Read the user instructions carefully before using the thermometer. If the child’s fidgeting makes it difficult to take a correct reading, turn the aiming lights on before bringing the thermometer close to the forehead. If your child has a perspiring forehead, or if it proves difficult to take the temperature reading on the forehead for any reason, you can take the temperature reading on the eyelid or on the neck. Using the “HOME” button Visiofocus® can also be used to read the temperature of objects and liquids in the 1 to 55°C (33.8-131°F) temperature range, such as temperature of a baby’s feed bottles, food, bath, etc.